Autumn Barnes-Fraser traveled to Germany for the first time between high school graduation and University of Montana orientation. Despite the nearly 5,000 miles between her hometown of Helena, MT and Berlin, Germany, “As soon as I hit the tarmac, I knew I had found home,” she said. Now Barnes-Fraser will be going back to Germany two more times, as part of the Missoula-to-Berlin International Reporting course at the J-school and for the Congress-Bundestag Youth Exchange (CBYX) program for young professionals. The CBYX program is a public diplomacy fellowship funded by the U.S. Congress and the German Bundestag and covers most of the participants’ expenses. 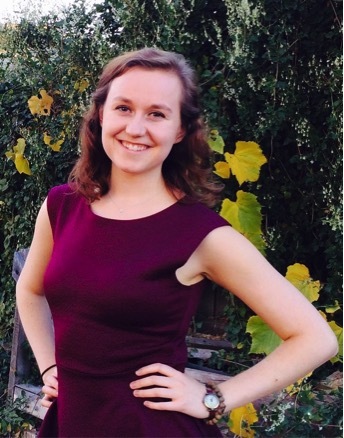 Barnes-Fraser found out she won the CBYX fellowship on March 7th, 2015, about a year after submitting her written application and successfully passing the interview process. The notification left her both ecstatic and dumbfounded. “I get to live in a culture that I love so much, and in a country that I feel so close to,” Barnes-Fraser said. 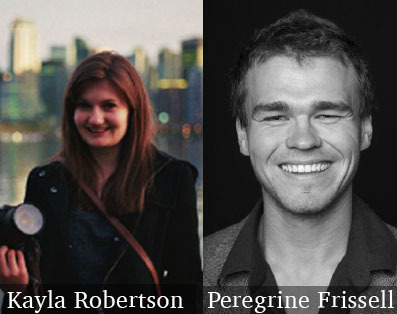 Lowisch has worked with Barnes-Fraser as part of the Missoula-to-Berlin reporting project. The project’s goal is to document Germany’s response to the refugee crisis while teaching students journalism skills for reporting abroad, in a breaking-news setting. In the fall, students focused on fundraising efforts for the trip, but now they’ve started pitching story ideas. Dean of the UM School of Journalism, Larry Abramson, who is co-leading the trip, agreed with Lowisch. Barnes-Fraser said the diversity of students in the class enhanced how they researched and reported their story ideas. While her double major is in Broadcast Journalism and German, others students have majors in Economics, Political Science and Business. “We all have different interests and different experience levels, so I think we’ll work really well together as a team,” she said. A month after Barnes-Fraser returns to the States after the Missoula-to-Berlin trip, she will leave for the year-long CBYX program, which is divided into three parts: language immersion, semester studies and a five-month internship. She hopes to focus both the studies and internship on radio journalism. Both NPR Berlin and Deutsche Welle radio stations would offer her the opportunity to report in German, then produce pieces in English. “I like the local perspective,” she said. Based on her experience, Barnes-Fraser said locals are usually more willing to talk with foreign reporters who make the effort to communicate in their native tongue. Personally, her favorite journalism pieces relate to human features and long narratives. Stay up to date with the latest Missoula-to-Berlin news via their Facebook page. One day in JRNL 100, Mason Birgenheier stood in front of the class and announced that KPAX-TV was looking for production help. He had been working afternoon shifts at the station, serving as a production assistant, when Ethaniel Fitzgerald heard his announcement. Fitzgerald soon landed a position at KPAX, helping manage and produce The Morning Show, clocking in at 3am and then leaving straight from work to go to class. Now, three years later, both Birgenheier and Fitzgerald have won NATAS scholarships for their dedication to the broadcast industry. The goal of the National Academy of Television Arts & Sciences (NATAS) scholarship program is to support promising students in their pursuits in the television field of journalism. As part of the award, winners travel to Seattle, Washington in June for further recognition and to go behind the scenes in a larger newsroom. 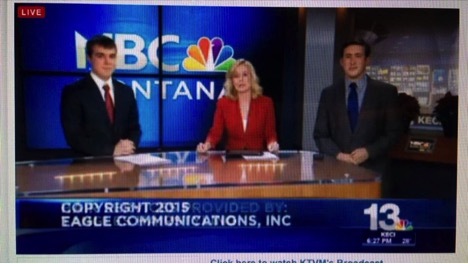 Ethaniel Fitzgerald delivers the news with fellow reporters for NBC Montana. As someone who grew up in Missoula, Birgenheier said that he enjoyed using his technological skills to keep people up to date with the local news. “I like knowing what’s going on in my community,” he said. While Fitzgerald also has substantial production experience, lately he’s been working as KECI’s weekend sports reporter. He said the position functioned at a different pace than the news, but it was still fun and exciting. Yet Fitzgerald’s inspiration at the J-school came from Ekness, who gave him technical advice and pushed him to be a better journalist. “He’ll do anything for his students,” Fitzgerald said. As both students head into their senior year, they plan to keep working at KECI and gain as much experience as possible from their jobs and from their classes. In 2016, the UM School of Journalism was ranked top-ten in the nation, and Birgenheier felt obligated to keep that reputation strong. Missed the 6 o’clock news? 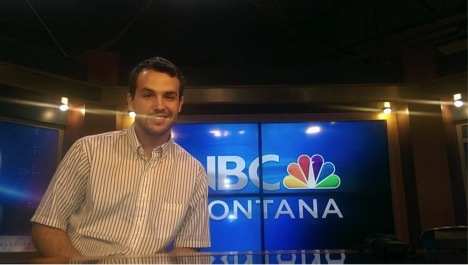 Follow Mason Birgenheier on Twitter, Instagram or the Montana Race Project for his contributions to local stories, and follow Ethaniel Fitzgerald on Twitter to catch up with the latest news in Missoula.